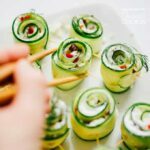 Greek Salad Sushi: an easy sushi appetizer, perfect for summer! Love sushi but not a fan of how long it takes (not to mention the mess?) Today’s we’re making a Mediterranean-inspired Greek Salad Sushi that takes everything good about Greek salad and wraps it up into a delicious sushi roll! Ever since I learned that cucumber makes an amazingly refreshing sushi base, I’ve been brainstorming ways to make a fun take on traditional sushi. And after getting a mandolin slicer for Christmas this year, I knew just what I would make. This Greek Salad Sushi! Rather than stuffing sushi fillings into the cucumber (like we did in the infamous Cucumber Sushi Rolls), today we’re thinly slicing cucumber, stuffing it with all the making for Greek salad, then simply rolling it up! No mess, no fuss, and so delicious. Here’s the rundown of how we’ll make these tasty flavor bombs. Slice a cucumber thinly (long-ways) and pat dry with paper towels. While your slices dry a bit, make a “deconstructed tzatziki” of sorts (i.e. tzatziki minus the cucumber). 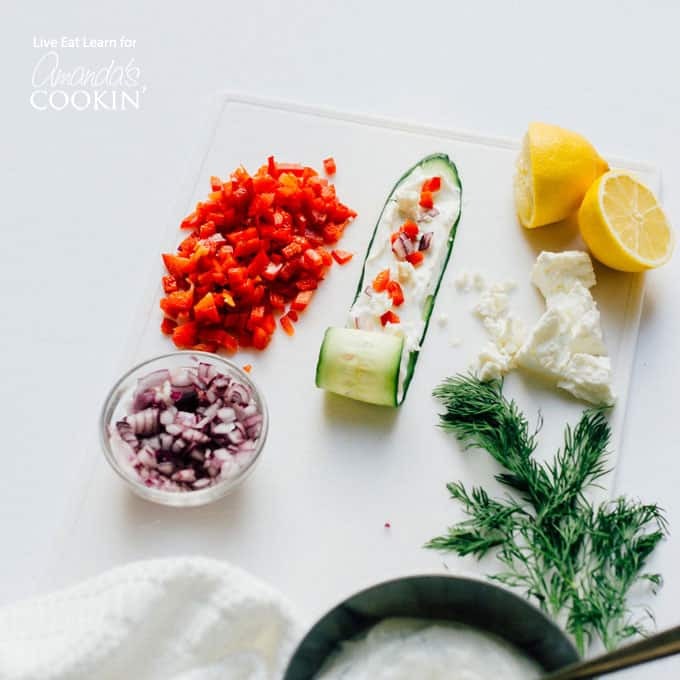 We’ll spread our tzatziki onto the cucumber, top with bell pepper, onion, and feta, then roll up. Secure with a toothpick and garnish with fresh dill. Tzatziki a creamy yogurt and cucumber sauce typically served as a dip or on meats. 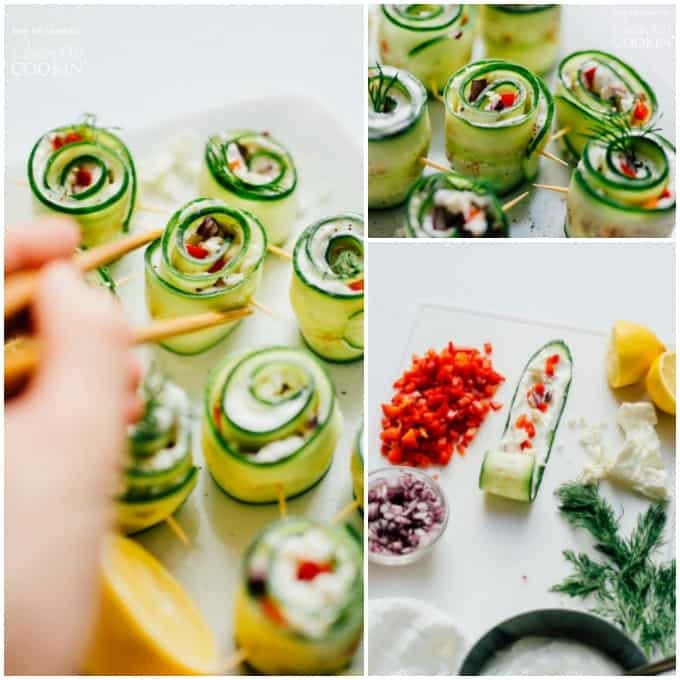 For another super tasty tzatziki idea if you to have leftover sauce (or just LOVE tzatziki flavor), is this Cucumber Tzatziki Salad. Made up of a few simple ingredients, you’ll have a refreshing and light summer salad that’s great to bring along to potlucks or BBQ’s! 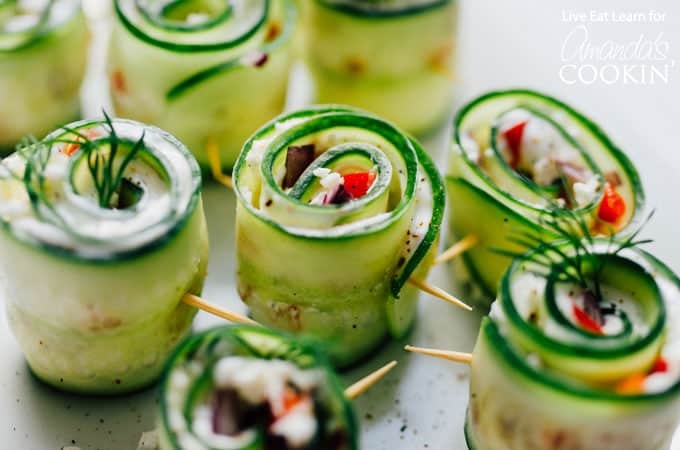 If you have any leftover cucumbers and are bringing this Greek Salad Sushi along to a party, whip up some Cucumber Sandwiches to bring as well! 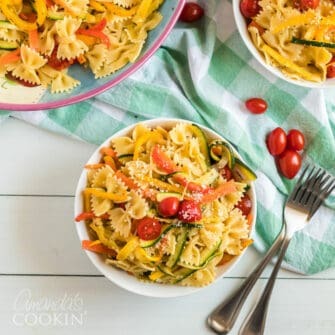 Or, if you’re looking to feed a larger crowd, a popular party staple is this Rainbow Summer Pasta Salad. Chop the ends off of the cucumber and use a mandolin or vegetable peeler to peel thin slices along, lengthwise. Set slices on a few layers of paper towels and cover with a few more. Pat to dry and let sit while you make the tzatziki. To make tzatziki, combine, yogurt, lemon, garlic, dill, salt, and pepper. 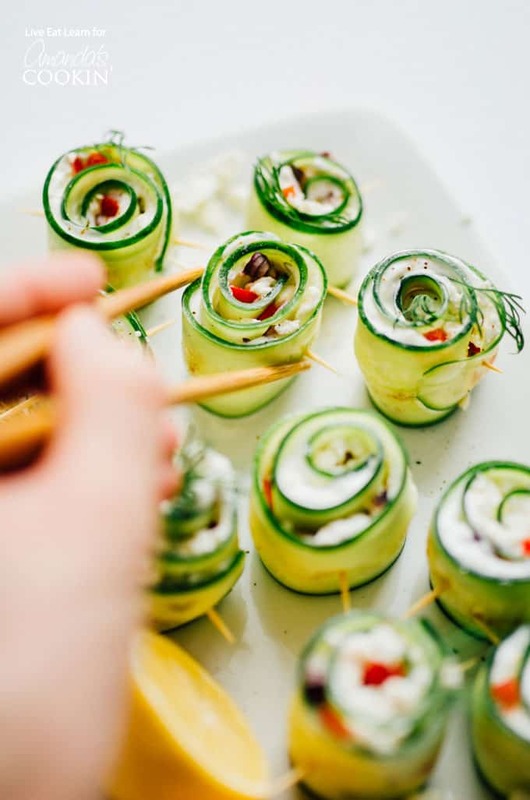 Spread some tzatziki onto a cucumber slice. Top with pepper, onion, and feta. Roll up and secure with a toothpick. Continue until you have used all your ingredients. That’s pretty creative… I’d love to try this recipe.